And thus...the real beginning of change. Can you feel it??? The "royal-love" on Friday and the "grand-PEACE-OUT" last night. It's been a tough decade and this is a pivotal point in getting us back on track...let's all get realigned on the correct priorities. For all you haters (read: super right-wingers, tea-bagers and the Fox network of sensational journalism), consider this a big do-over on Obama. You can pretend that you actual like the man (who you voted for anyway and secretly admire), and get behind this great leader 'cause he's doing a damn good job! We all need a great big bowl of love to serve to eachother!!! One great nation aligned...imagine that? Support your Prez! He needs the groundswell of positive emotion to ignite thus country... We all do! And support your troops who swooped in and took out the biggest loose canon the world has ever know, while you were enjoying mimosa's on a gorgeous Spring Sunday. Hopefully, they can start packing their bags now. 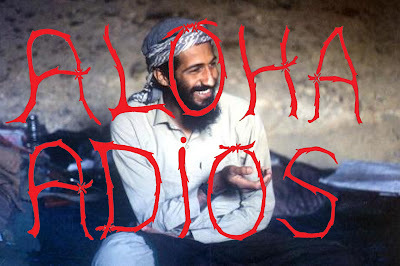 And to Osama, Aloha...Adios! You're DEAD dude!